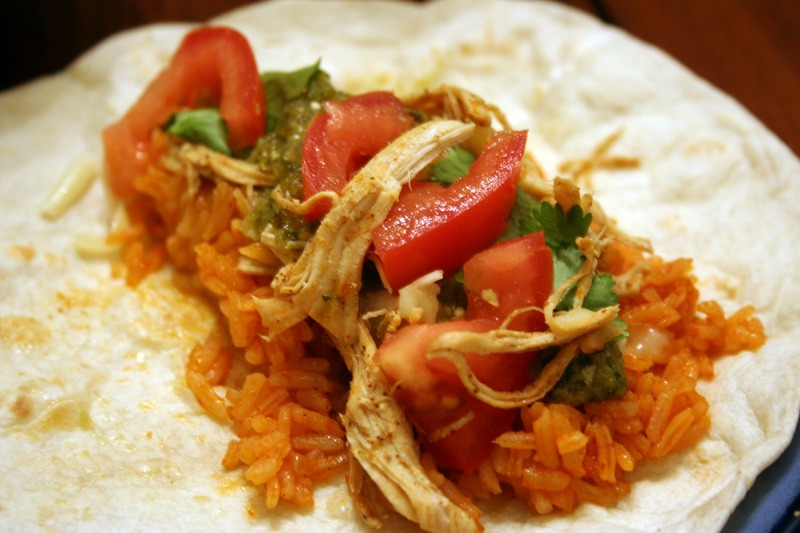 Taco night is everyone’s favorite night:o) I have used this recipe before and it’s always a hit. Whenever it’s taco night, I always make my “orange” rice. It’s something I grew up eating and all the ladies in my family make variations of my Gram’s. It’s so simple and so comforting to me, and I love that my kids both really enjoy eating it, too. I remembered I had some homemade salsa verde in the freezer that was waiting to be used, so that’s what that green sauce is on the taco. I will be sure to post the recipe for that the next time I make chile verde or my husband’s favorite – chicken enchiladas with roasted tomatillo salsa. I haven’t made that meal in so long – it’s a lot of work and it makes so much food, but the flavor is excellent. Anyway, these turned out great – the two men of the house had seconds. I however refrained from indulging in more carbs (frown). I did eat a nice green salad with lots of extra veggies, though. I am on my annual “health kick”…well, I guess it can’t be called annual if this is my third time this year. The holidays and all the yummy-bad-for-you-food caught up with me, along with the lack of exercise. Basically I have been feeling uber-blah, so in the past when this blah-ness has reared its ugly head I cut out a lot of junk and add in lots of fruits, veggies, whole grains and cut out lots of empty carbs. I feel a difference within a day of these changes so it’s totally worth it and then I wonder why I don’t eat like this all the time. Oh, yeah! It’s because it takes thought, preparation and discipline! Thanks for reading, enjoy! Heat the oil in a medium sized sauté pan. Add the onion and sauté for 5 minutes. Add the cumin, chili powder, coriander, paprika and garlic and sauté two more minutes. Deglaze the pan with the chicken broth making sure to scrape up any browned bits. Turn off and set aside. Sprinkle the chicken with salt and pepper. Add to crock pot. Squeeze the lime on top, add the cilantro, jalapeno, and pour the onion and garlic mixture over top. Cook on low for 3-5 hours, or until cooked through (different crock-pots cook at varying heats) and tender. Remove chicken breasts from the crock pot, shred and place in a bowl. Scoop out the onions and add to the chicken. Depending on the amount of juices produced, you may want to add some or all of the juice back to the shredded chicken. For fast and easy soft tacos, add this chicken to taco sized flour tortillas with shredded lettuce, avocado, tomato, cilantro, red onion, and cheese (I like cheddar, pepper jack, or feta best). Add a dollop of sour cream and salsa, too, if you like.